what your manager needs - Work ... Uncaged. I work with computers and this allows me to work from pretty much anywhere as long as I have Internet access. My telecommuting started small, with a day here or there and then a permanent one day per week at home. I gradually managed to increase my time where I only occasionally traveled to the office. There are a lot of blog posts like 6 tips for convincing your boss to let you work from home and 7 Steps to Persuade Your Boss to Let You Work From Home and 10 Ways to Convince Your Boss to Let You Work From Home. There is a lot of good info about the generic benefits of working from home or telecommuting. For me, it ultimately came down to answering one primary question. The most compelling argument to convince your boss to let you telecommute. 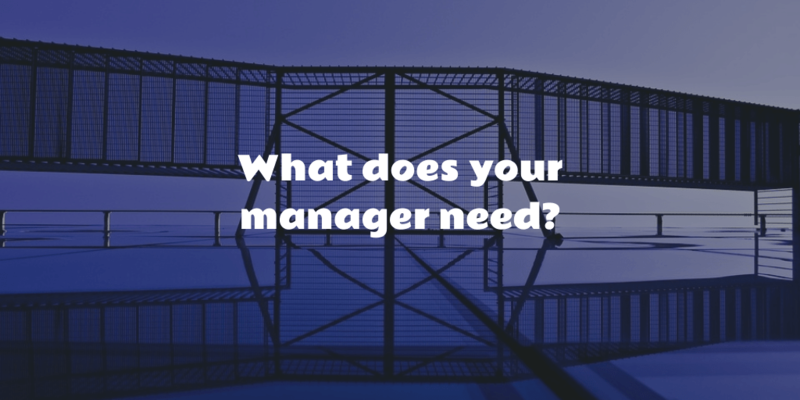 What does your manager need? If you think it’s about work getting done in an effective way, than you’re spot on. Your boss pays you to do your work. When you work at home your manager may feel like there is less visibility of you actually working. To me physical presence has always seemed a bit weak as assurance. I think we’ve all seen people go for very long trips to the coffee machine, take extended lunches, check Facebook, or just chat about the weekend at someones desk. I won’t claim that this doesn’t happen when telecommuting. In the end it’s about results and demonstrating productivity doesn’t require physical presence. The secret is that you should go the extra mile to communicate your efforts. The most effective way I’ve found is in the form of a daily update. The purpose of the daily update is to serve as a steady reminder that you are doing work. It doesn’t need to be a lengthy minute by minute account. The opposite is true. A very long update only adds burden to you and your manager. That is counter productive. Instead a short and sweet email is all that’s needed to spark the notion that “yep, work is getting done” and it’s also easier on you to generate. The result will be confidence in your ability to work away from the office. You’ll also be more transparent than your office brethren who will only be physically present but without a clear indication of continued progress. Generally, my daily updates follow a very simple recipe. A list of bullet points of things I worked on. Never more than 1 for each hour and often only 2-5 bullets of the day’s accomplishments. I also add another list of bullet items of what I have planned for the following day. I send this out as the last thing I do for any given work day. This should be enough for your boss to understand your efforts for the day. It will take you 5 minutes to put together and even less time for her to read. The value that brings in terms of transparency is far greater than it might seem. I started this before I began working from home consistently. I realized that raising the awareness of progress was a great way to develop an understanding of my habits and build a great relationship with my boss. The feedback has been nothing but positive. Again, it will set you apart from most others and greatly increases your value, since your boss will never wonder what you did all day… whether in the office or remote. Getting started was pretty easy. During my one on one with my boss I mentioned that “I keep a daily log of work accomplishments. I would love to share them. Is that ok?” There were no objections. That evening I put the short update into an email with the subject of “Daily Accomplishments for <insert date here>”. That subject line did a couple of things. First, it emphasized “daily” and builds an expectation. Second, using “accomplishments” rather than “update” or “work” adds positive light, since an accomplishment is generally seen as a good thing. It looks better. But why daily? Well, I’ve been a manager myself. As such I was very hands off. I’ve only ever “mandated” very few things of all employees. One of these mandates is some form of regular update at least once a week. Most employees choose a once weekly approach. That frequency works OK, but it eliminates 4 opportunities to look good. It’s also harder to summarize an entire week and is more burdensome to consume. Lastly, it reduces the opportunity to get quick feedback. For example, if your update lists an item you plan to work on but it’s actually no longer needed. Your boss may have forgotten to mention it and this offers another opportunity for a quick response letting you know. The one big gotcha with all this is consistency. If you set the expectation of a daily email and then don’t send it, you’ll end up looking flaky. However, the brevity of the daily update should make that much easier. Just set yourself a daily reminder until it becomes habit. I personally just have it always remind me… just in case. As you send these updates (and remember to do it when you’re in the office as well), you’ll start building greater confidence in your ability to get things done. As you work from home, which may only be occasionally to start, you will reinforce this confidence until the concern over your telecommuting melts away.